And so goes the words of Joe Sherman, Clemson class of ’34. If you’re a Clemson grad, then you know those words. They echo with a soft, but firm voice through your head when you cross paths with tiger paw prints on your way into campus. When Mr. Sherman wrote those words, he embodied the true feeling of Clemson, the city, the University and the mountainous valleys of the Blue Ridge Mountains that seem to protect Clemson in its own little shell. Tillman Hall, welcoming everyone back. I grew up a Clemson fan. No one in my family ever graduated from there, but my grandfather did attend. Unfortunately, he had to leave when the Great Depression hit and he never returned to finished his education. My blood has runneth orange for as long as I can remember. 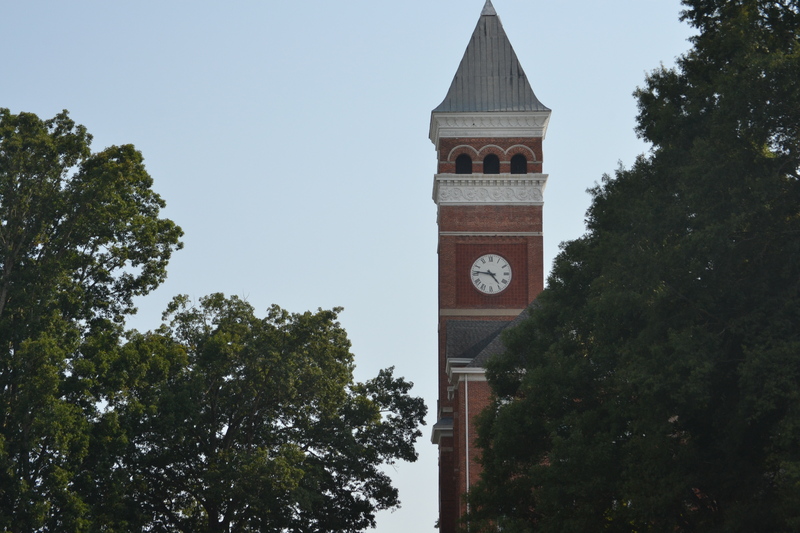 There is no better place in my eyes than Clemson University. 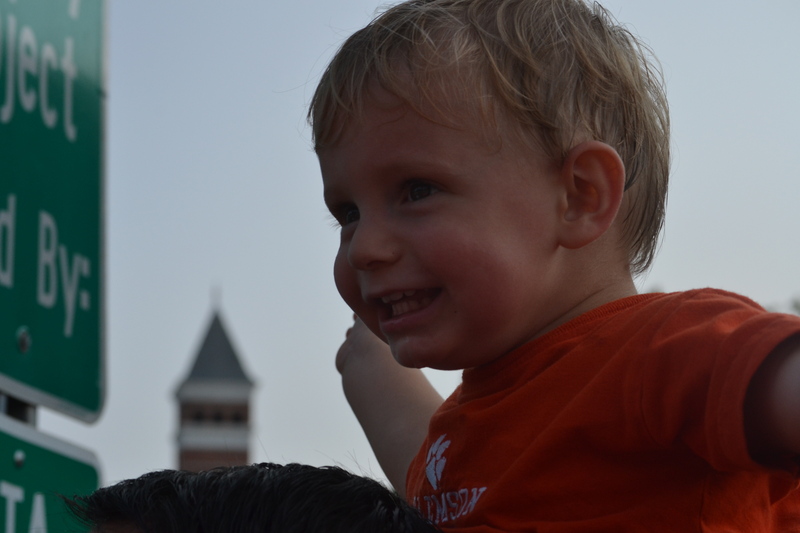 Henry enjoying the last days of summer on Bowman Field. When I drive into the City, I find myself reminiscing over days at Pixie and Bill’s and Calhoun Corners, the parties at Golden Woods and my apartments off campus. I think with great fondness to the nights of eating gravy fries at The Huddle House or devouring some of the greatest sandwiches I’ve ever had at The Pot Belly Deli. As I drive through Main Street, I look back with affection on the year I lived downtown, how convenient it was to hit up any of the local spots. The Thursday night dance parties at TD’s, and the Monday night $1 Coronas at the Esso. I made wonderful friends and created lasting memories. 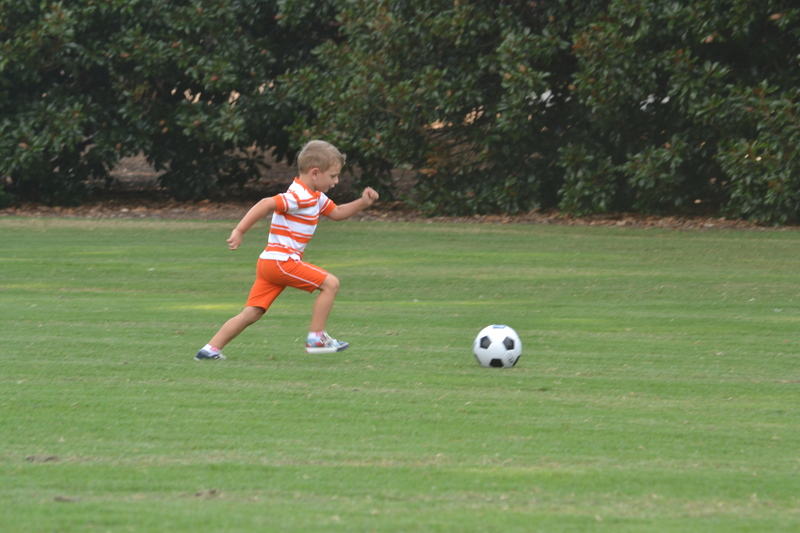 Davey playing soccer on Bowman Field. As I continue to stroll through, I come across Bowman Field, with the beautifully bricked structure of Tillman Hall behind it. The bells chime a wonderful tune and I’m immediately transported back to Fall afternoons walking through campus, the leaves blowing around my feet, playing peek a boo with the list of names of graduates from years past that are imprinted in the sidewalks. I can smell the hot humidity of the summers, the juicy crispness of the falls, the heaviness of the winters, and the awakening vibrance of Spring. Henry’s new kicks. Fitting for our adventure. I can remember all of my classes, my professors, walking to class with roommates, eating at the Student Union, waiting in lines forever with heavy books to purchase, and my all time favorite place…the library. When I remember all of this, I have a sense of longing, of sadness, and happiness all bundled together. Those years, at this wonderful University, were some of the best years of my life. 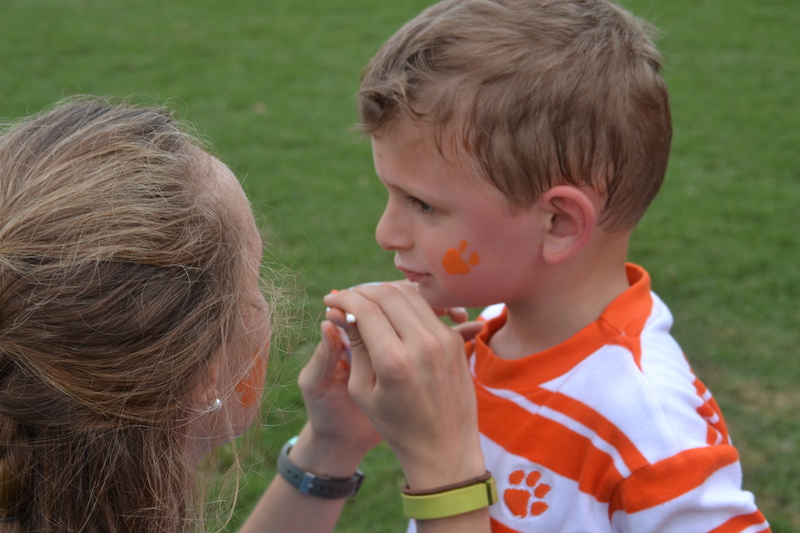 Getting his first ever tiger paw painted on his face. When my husband moved South from NY, I didn’t give him a choice of college teams to pull for. If he wanted to date me, then he was a Clemson fan. No questions, no debates. That was the stipulation. He didn’t argue. 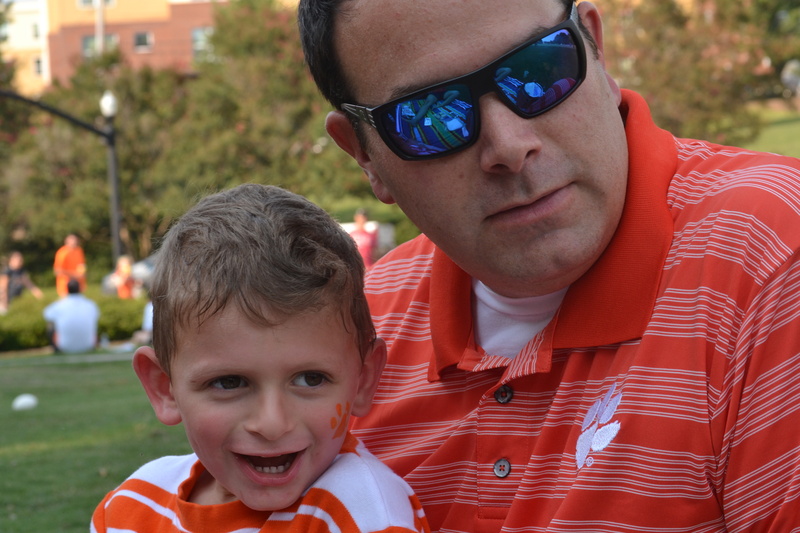 Naturally, I’ve made sure my boys are Clemson fans as well. I bought them Clemson gowns, hats, and booties to wear home from the hospital. 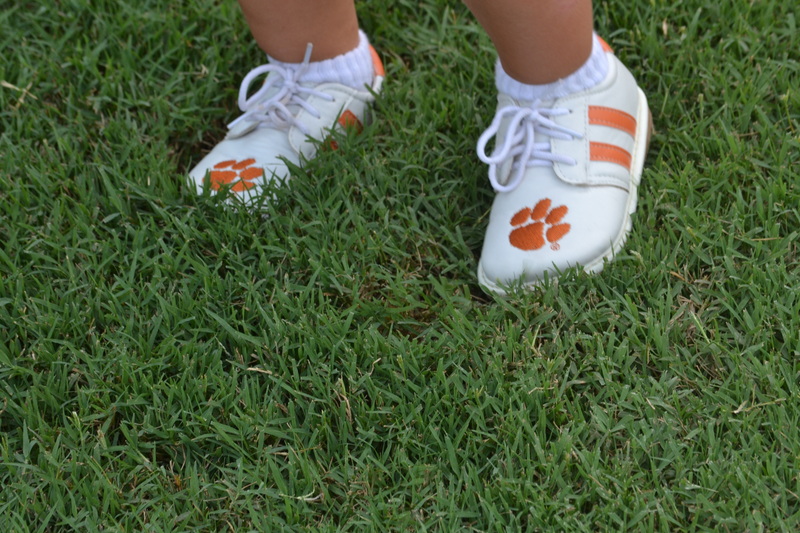 Their first stuffed animals were Clemson tigers. They’ve had overalls, t-shirts, socks, jerseys, and hats. I’ve even stood in line to get an autograph from C.J. Spiller for Davey. My boys are Clemson all the way around. Davey and Daddy enjoying the day. This past Friday, my husband and I took them on an adventure. 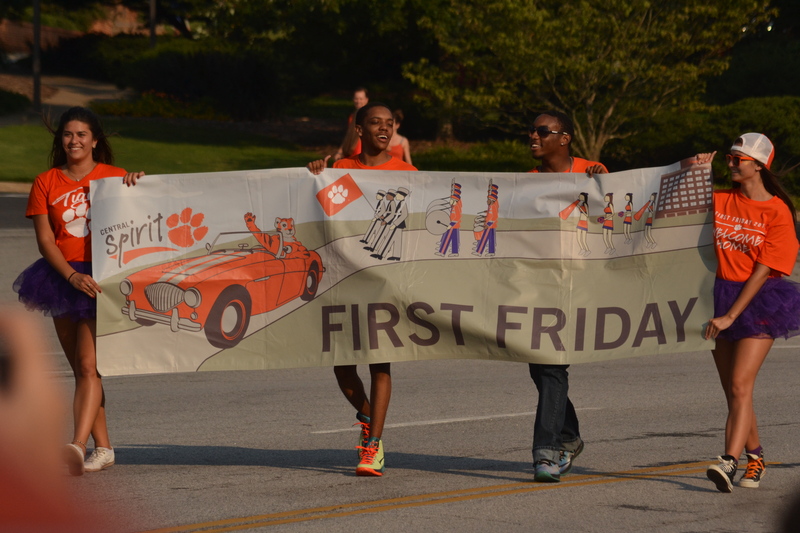 We decided to go to the First Friday Parade. We arrived two hours early, but traffic was still horrendous. We parked down town, which allowed me the opportunity to visit some of my haunts, even if only through the windows. From the moment we left the car, I listened to the bells of Tillman Hall chime a tune. Louder and louder they rang as we walked closer until finally the beautiful tower was within my view, peering around overgrown oak trees. I felt as if it were smiling down at me and saying, “Welcome home.” Resting comfortable at its feet was Bowman Field, the original field for the football team, but a place now for sunbathers, Frisbee throwers, and picnickers. 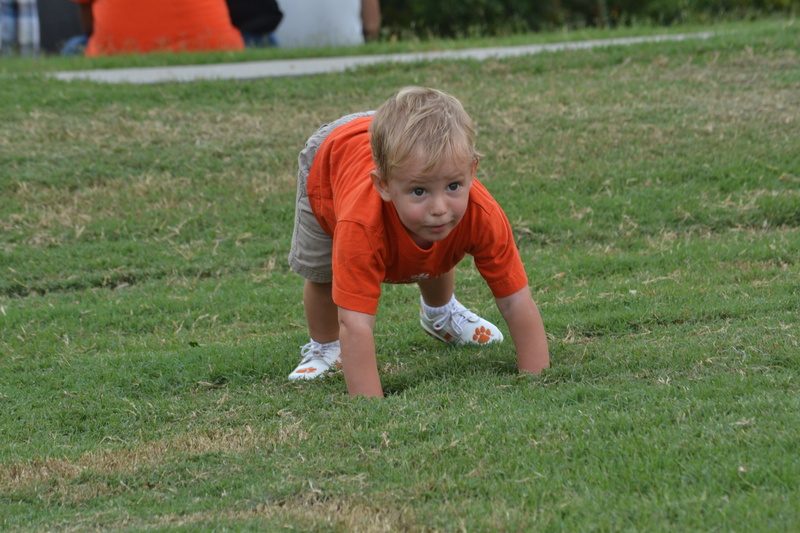 Our future defensive line man. Coach Swinney needs to check him out. We set up our picnic in the shade of the trees right in front of Holtzendorff Hall. 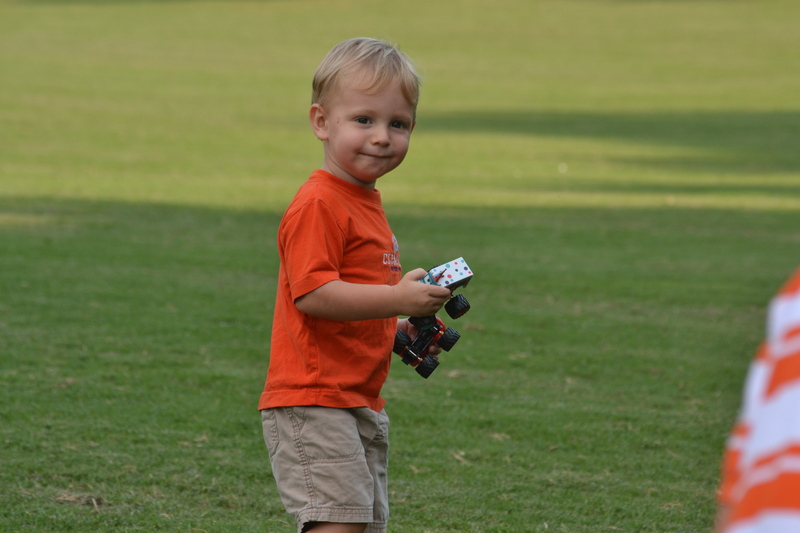 I sat back on the blanket, camera in hand, and smiled as I watched my husband and sons, all decked out in orange, run and play on the field. I clicked away, documenting the memories on my camera. I took a brief respite from the picture taking to just really take things in, to tilt my head back and breath in that beautiful mountain air. I was home again, well my second home, and it felt good. Three of the most beautiful flags I’ve ever seen. I watched the new students walking around, briefly thinking that technically I’m old enough now to be their mother. Yikes! But really, I just smiled with happiness over being able to share this wonderfully magical place with not only my husband, but also our sons. When I was a college student at Clemson, I NEVER wanted to have kids, so I never could imagine being back with two potential future Clemson students who shared my blood. The parade was everything I remembered. 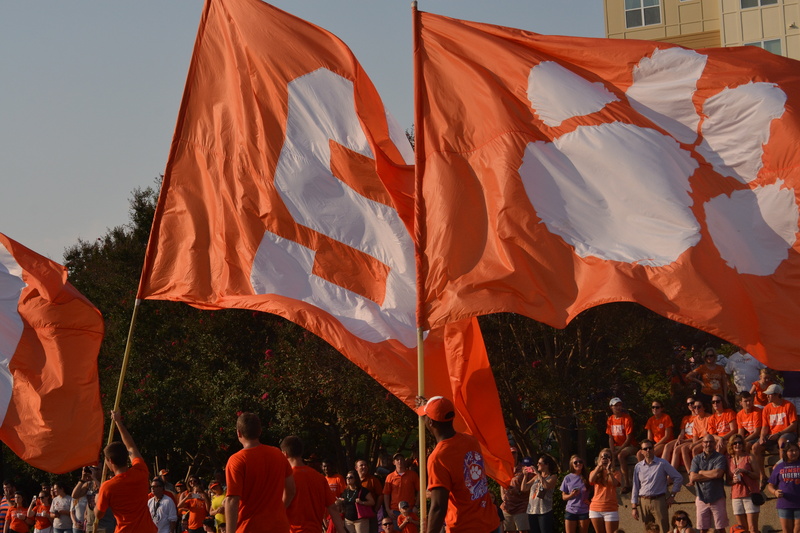 It was oozing orange, inflated with the spirit of Clemson University. 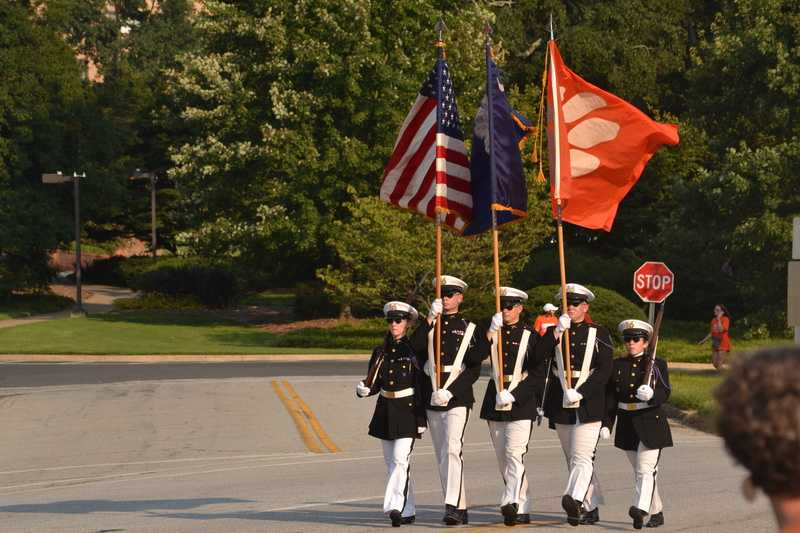 Tiger Rag and Clemson Cadence abounded everywhere. Davey even managed to start his own cadence which everyone followed. I could never put into words my overwhelming happiness from Friday. Those of you who don’t know this university, or even those of you who hate it, will never understand how something like this can create such a sense of pride, happiness, respect, and fun. Yes, Mr. Sherman, you were right…There IS something in these hills. And I’m so glad to experience it.